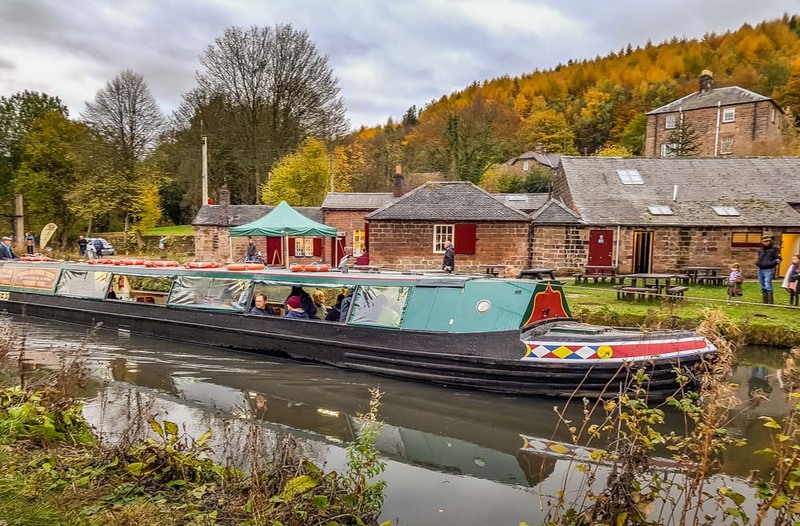 High Peak Junction is nestled beside the Cromford Canal and was an industrial hub of activity back in the days of canal haulage, the High Peak railway was the one of the worlds earliest long-distance lines, built 1825 – 1830. The first locomotive arrived in 1841 and was called “Peak,” built by Robert Stephenson and Co. The track ran behind the workshop, and the original water tank for re-filling the steam trains still stands behind the workshops with a carriage sitting on the lines beside it. 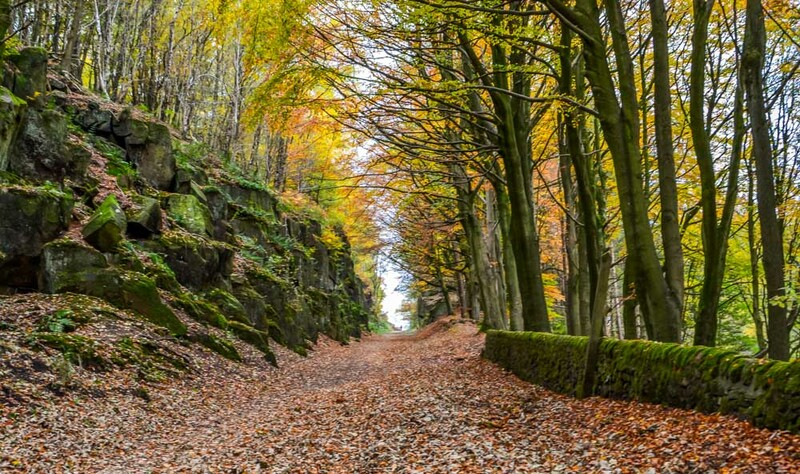 The High Peak Trail stretches out for 17 ½ miles through to Dowlow near Buxton. In the industrial days when this would have been a busy track, mostly transporting minerals from the quarries, later a licence for carrying passengers on a separate track. 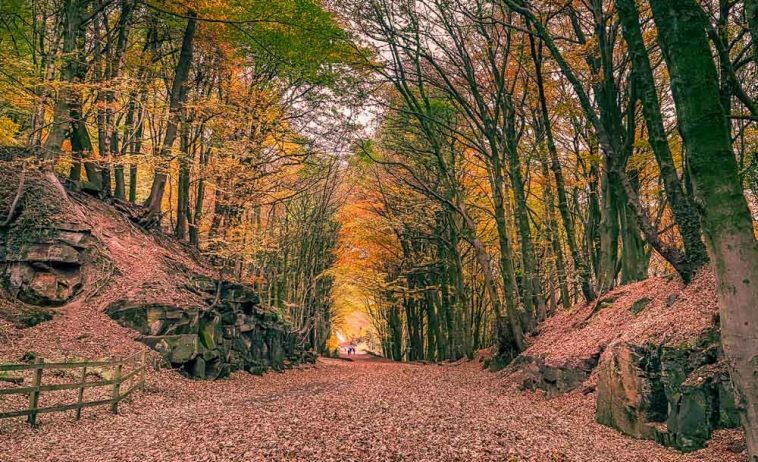 Steam trains would have had an extra help on these steep inclines using a pully system with heavy cabling, although originally Hemp rope or chain was used, the cables can be seen today as an example. The locomotive and train were hauled up by a static steam engine. The inclines are so steep, braking on these sections as you can imagine was also very tricky. There were only a few local accidents involving locomotives the most serious was a fatal one in 1937. High Peak Junction workshops these days is a tourist centre which also has a working forge, that was fired up on our recent visit and examples of local crafts such as a basic wood turning lathe, music was laid on and relaxing too. 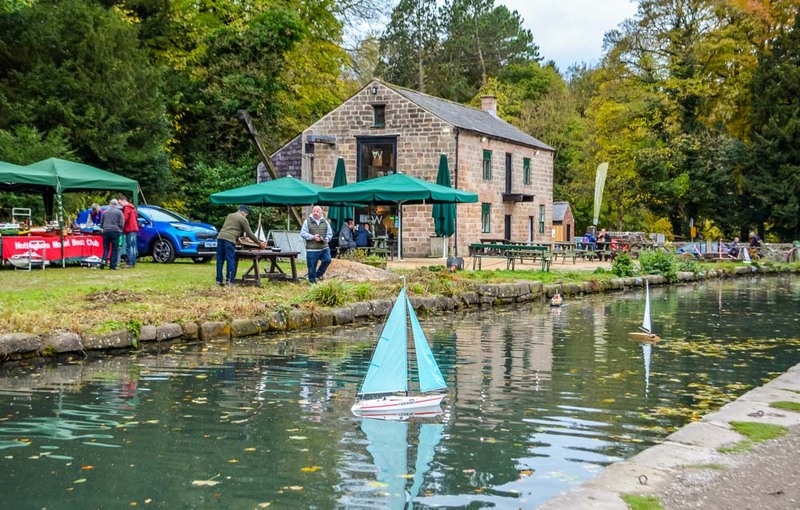 We found out later in our circular walk at a café at Cromford canal, the Friends of the Cromford Canal had organized the activities which made our walk so interesting and fun. High Peak Junction in the Derbyshire Peak District has been a family favorite location for many a year and we often combine our visit with a relaxing circular walk along the high peak trail to the top of the first incline and follow the sign posted walk down into Cromford Village, such a pretty little village with a variety of shops, a beautiful mill pond, Greyhound Pond, and plenty of history to boot. On our route through Holloway on the Lea Shaw Road, we like to pop into the local butcher’s shop for a few items to add to our packed lunch like a nice piece of cake for instance. 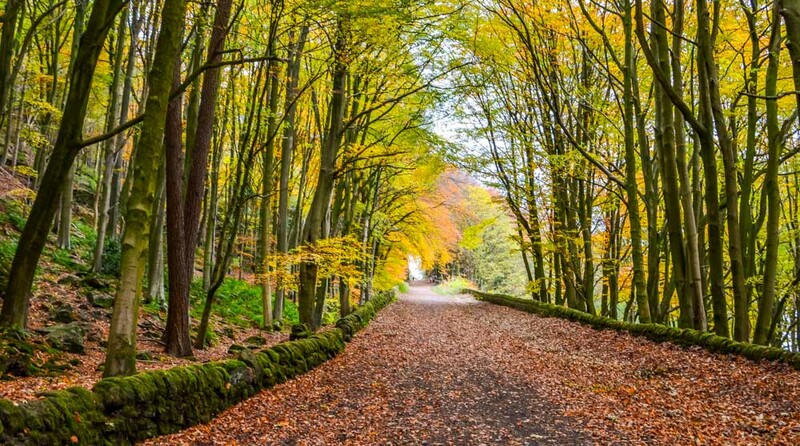 🙂 Our walk began at Lea Mills, Matlock, a great area for walks in woodlands and meadows and shopping too at John Smedley’s Mill shop, a local industry inspired by Sir Richard Arkwright since 1784. 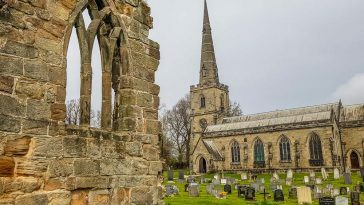 This walk was one taken without the dogs and we traveled light, only a small backpack carried for water and rain coats, and so we strode off along the road until we reached the High Peak Junction car park and then over a little bridge over the river Derwent. The railway runs alongside the canal here and we crossed over the railway bridge onto the towpath. At the High Peak Junction workshop there’s a convenient toilet block as well a lovely shop with friendly staff on hand who’ll be happy to help and there are workshop tours available on set days. After a quick freshen up, my husband, daughter and I started off up the sheep pasture incline through the short tunnel section that takes the trail underneath the a6 road and past the catch pit, where you’ll notice a crashed wagon still inside it. The incline is steep and has warning signs for cyclists due to it’s gradient. 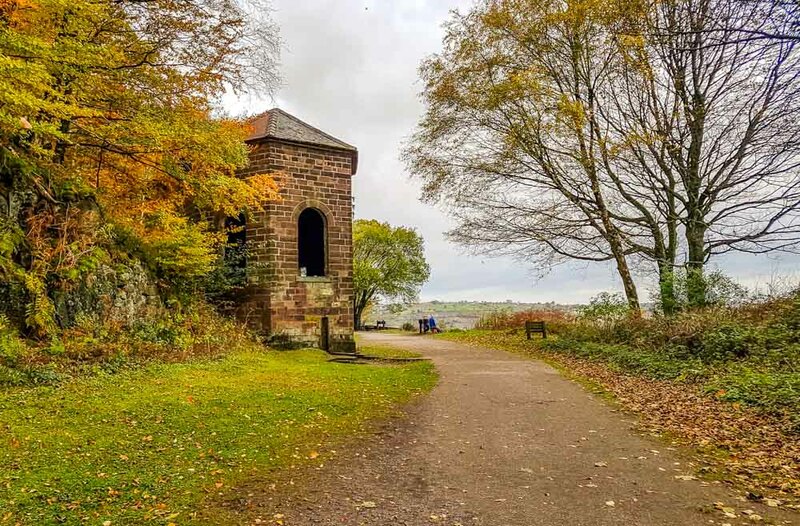 It’s a beautiful trail with views for miles around from the top and there’s a few picnic benches, just perfect for a little break and time to take in the view. We stopped here for lunch while we took in views across fields and woodlands, the picturesque Cromford village is in sight from here and directly ahead, dominating the area is Sir Richard Arkwright’s Willersley Castle which the inventor and industrialist had built as his main, grand home, though unfortunately was not completed before his death on 3 August 1792 (aged 59) and as such, never had the opportunity to live in it. 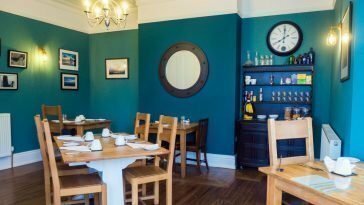 Willersley castle is now a Hotel and conference centre. 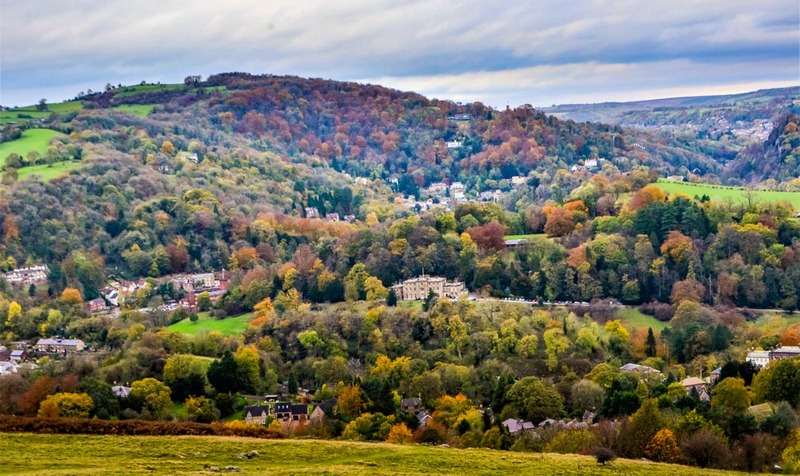 Matlock bath is clearly in view from the top of the incline, Sheep Pasture Top, and if you look very carefully you may even be able to see the cable cars that connect the Heights of Abraham to the cliffs above Matlock Bath. Below in the valley is the Derwent Valley Mills World Heritage Site. 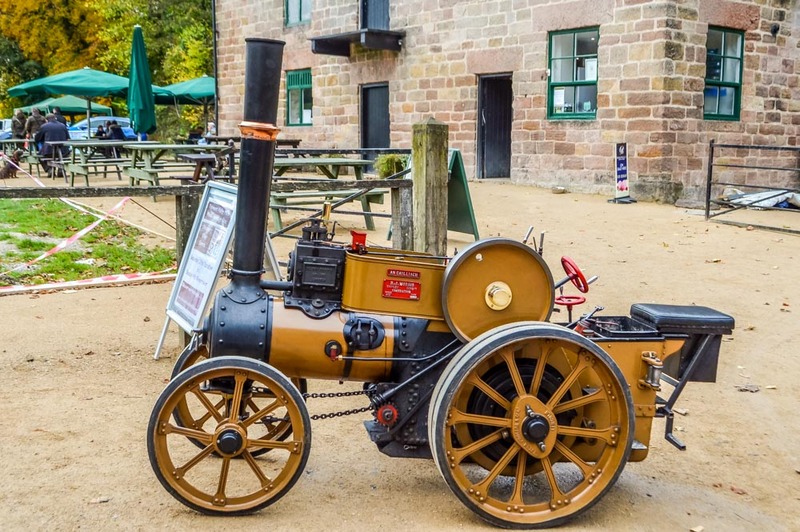 Sir Richard Arkwright’s mills can still be seen today, and most can be visited locally. 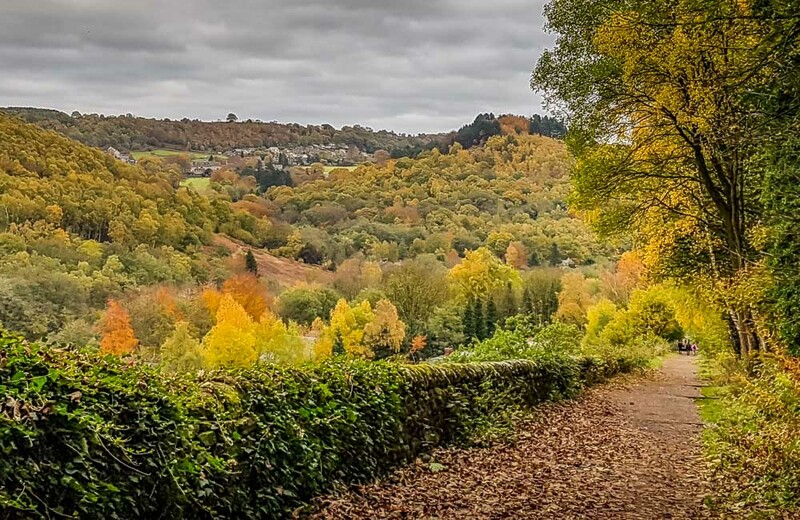 A short walk from this point beside the picnic tables is the sign posted track down towards Cromford village. I’ll add another additional route for you here, just in case you’d prefer the slightly longer route and with a rocky interest, if you continue on the High Peak Trail a little further you will arrive at Black Rocks, an outcrop of Ashover gritstone, well worth it for the amazing views, more car parking and toilet facilities can be found here too. We walked down the way marked pathway through the pasture field and wound our way down into Cromford village where you can find plenty of opportunity for refreshments and shop browsing, such a lovely area and was home once to the mill workers, Sir Richard Arkwright built a large part of Cromford’s housing for the mill workers and also the Greyhound pub, chapels, shops and a school. A short walk and across the A6 road and we find ourselves at one of Arkwright’s mills, Cromford Mills, so we popped in for a short visit. 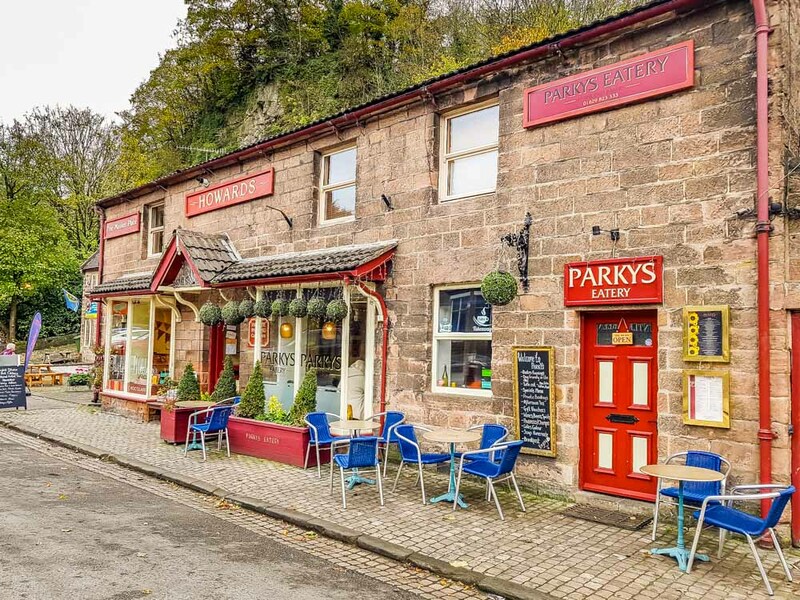 Cromford Mills is an amazing place to visit and contains within its courtyard small cottage industry units, including an antique shop and gift shop and a café plus much more and has a wonderful atmosphere to soak up, not even mentioning the history of the mill and its renovations. 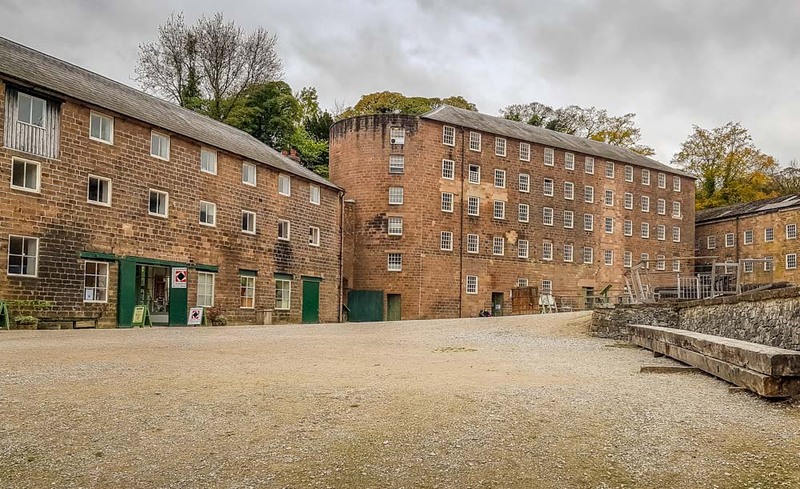 Cromford Mills has been shortlisted as one of three finalists in the “Best Major Regeneration of a Historic Building or Place” category of this year’s, (2018) prestigious Historic England Angel Awards. 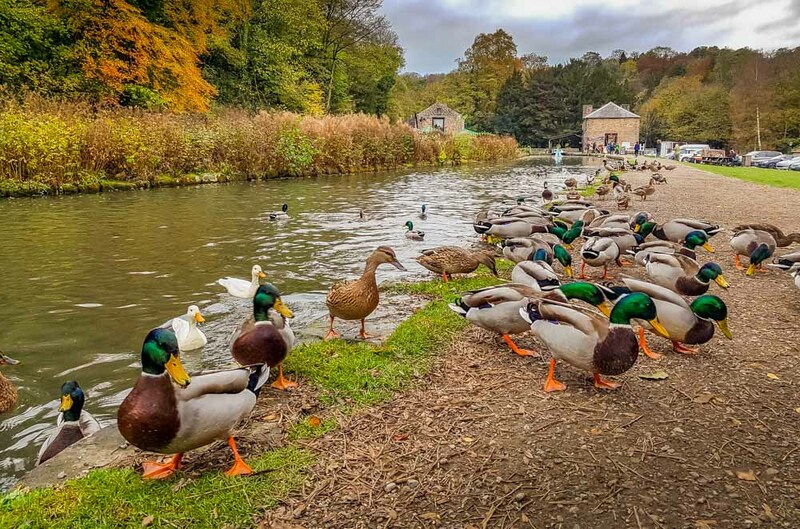 Onto the Cromford canal and time for a well earned coffee break, the coffee shop next to the Cheese shop is a lovely spot to chill out and sells much more than coffee and cake. Rather than buying a slice of tempting cake, I bought myself a nice bag of whole meal strong flour for bread making, also a local product from Cauldwells mill at Rowsley, Matlock. I enjoy baking, and I think this flour will be perfect for some nice bread rolls. After Coffee we strolled along taking in the activities beside Cromford wharf, a few beautiful examples of miniature steam engines were on display at the wharf and one was steaming along and took a couple of passengers, so nice to see them working. Beside the canal a lovely hand turned musical box if that’s the right term for them, the kind that take music cards and turned by handle to produce the music, it sounded amazing and looked like hard work to keep up, but the musical tone was carried on the air and cheered the soul. A little further along and model boats were being sailed along the canal, lovely sight. We fed the giant army of ducks on the canal and then it time to get moving along the canal back to the High Peak Junction workshops to complete the circuit, we arrived back to the workshop just in time to watch a horse drawn Barge coming through taking passengers for trips along the canal. 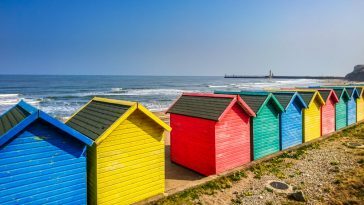 What a fabulous sight to see, and what a nice experience it must be too.